Cymbidium wenshanense will not be featuring in 365 days in 2019 as our small plant has spent the last 12 months putting all its energy into growing a large seedpod that finally split this week. It was the first flowering at Writhlington of this distinctive cymbidium species from China and Northern Vietnam. The species is reported growing as an epiphyte in evergreeen forests from 1000 to 1500m. The species is small growing for a cymbidium with fine leaves but has large attractive flowers with lovely lip markings. The fine picotee edge to the lip given by small pink hairs is particularly startling. The flowers are also sweetly fragrant. 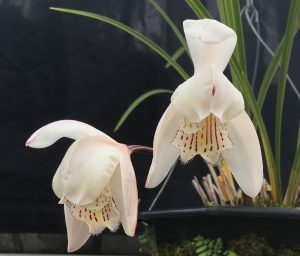 As we noted last year the species not commonly available as seed raised plants and so we pollinated the flowers last February in the hope of raising seedlings in our lab alongside our many other Cymbidium species. On friday we sowed the first batch of very healthy looking seed and hope to see germination in the next three weeks – we will keep you informed. 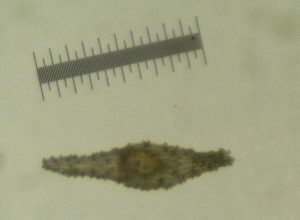 Interestingly Cymbidium seed follows a pattern where the size of the seed is proportional to flower size and not plant size, so the seed of this small growing species is very large at 1.2mm long.